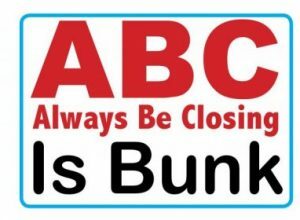 Media buyers say “call on me,” and “I’m the decision-maker.” But their bosses, senior executives or business owners, are the real decision-makers. Media buyers don’t decide what to buy; they decide what to recommend to their bosses. And they recommend what they think their bosses or clients will like. In advertising-media sales it is critical to get appointments with senior management and to be effective in those meetings and in building those relationships. How can ad-sales managers build genuine rapport, and keep an open door, with senior executives in the media buying process? Why do sales people have such a hard time with bringing value to sales relationships? Harvard Business Review gives us 7 reasons. Reasons one and two in the HBR story are connected: Sales people lose sales when they are not trusted and respected and when they can’t communicate effectively with senior executives who have the final say. That is why top ad-sales people bring value to the ad-sales call. Good presentations start with observations about the prospect’s situation and needs, not about the media being sold. The relationship is built when a media-seller brings new information or new perspective about the prospect’s market, or about how the prospect’s customers make purchase decisions. 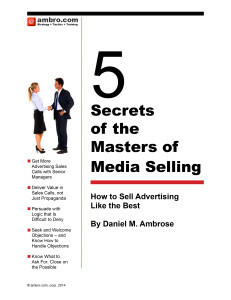 Ambro.com has been teaching the 5 Secrets of the Masters of Media Selling for years now…we teach you and your team how to get more senior level appointments, and how to be more effective in those appointments. For a few sales people send them to my Masters of Media Selling public seminar in New York City November 15th. Or contact me for a custom seminar for your company.